I’m back with the second part of holiday makeup in green version. This time the style is going to be very different from the last article, where the look was natural and flawless. This looks will suit great the “wild” ones – bohemian or rock’n’roll style girls. Both looks have the eyes accentuated. 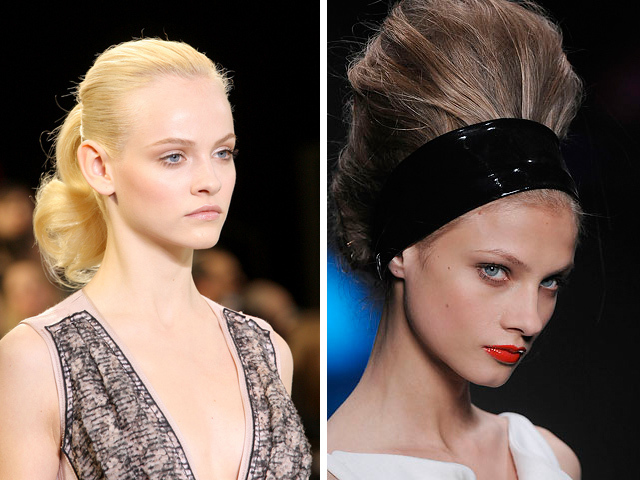 This look is the best for brunettes or platinum blondes, perhaps with long and wild looking hair. Here it is very important to make the skin looking fresh and young – not looking heavy or too matte. Avoid this make-up if you have very dark circles or puffiness around the eyes. – Prepare the face as good as possible. Start with a good organic skin care; clean properly the face with a cleansing milk or gel, appropriate for your skin type. Proceed with a toner or a floral mist for the face and finish with a moisturizing cream. If you have time, you can relax for a few minutes and put a hydrating mask on the face between the cleanser and the toner. You can choose between various good organic skin care brands. A few good suggestions: The organic pharmacy, Farmaesthetics, Suki, 100%pure. – I suggest to choose a tinted moisturizer, in this case skip the cream. If you don’t have a tinted moisturizer you can add a few drops of your liquid foundation in your cream and mix them together. You will get a nice tinted moisturizer that will add you a sheer and fresh glow. A very good choice is the Organic Glam Sheer Tint. – If you have any imperfections use the Organic glam concealer and tap it precisely just on the areas that need coverage. – Choose a hydrating cream blush in rose shades to add a touch of color to the face. This will refresh the entire look, so that the eyes won’t look so heavy. Apply 100%pure lip&cheek tint on the cheekbones to sculpt the face. Choose the shimmery strawberry shade. – If needed, dust gently with Organic glam loose powder on the T zone (chin, nose, forehead). – Eyes are the most important step here: start with the smoky eye technique where you will need a midtone and a darker shade. Choose 100%pure eyeshadow in vanilla sugar and apply it with a large eye brush on the entire eye lid towards the eyebrow bone. Proceed with a dark brown shimmery shade on the upper and lower lash line and blend it well around the eyes. Make sure to elongate the shadow on the outer corner of the eye to achieve a cat eye look. 100%pure eyeshadow in chestnut will work great. – Accentuate the shape of the eyes and line the eyes with an eye pencil in dark brown. I don’t suggest doing the line on small eyes, cause they will look even smaller. Use the Organic Glam Mineral Eye Pencil in dark brown. – With a touch of gold color give the eyes a 3D effect. Use Alima pure Luminous shimmer eyeshadow in Gold dust and make a V line (upper and lower lash line) in the inner corners of the eye. If you want an intense golden line, damp your eyeliner brush in water and then in the eyeshadow to achieve a wet and more intense effect. – Curl the lashes with an eyelash curler and apply generously a black mascara. Jane Iredale Longest Lash Thickening and Lengthening Mascara Black Ice will be a nice choice. – You want the lips to be almost invisible, so put on just a transparent Lavera lip gloss n.1 or just a lip balm. Let’s say that this make-up is a lighter version of the previous one in a certain way. The difference is just in the intensity of eyeshadow colors, but the technique is almost the same. This is a softer and more natural look, suitable to update your day make-up, if you have no time. – Apply with fingers RMS un cover-up on a cleansed skin and tap it well into the skin until it disappeared. This is a great product that you can use like a 2 in 1, instead of foundation and concealer. – If you have dark circles around the eyes, cover them with a touch of colored concealer for the under eye area. Use Jane Iredale CircleDelete Under-Eye Conceal in an appropriate shade for your skin. It will do wonders! – If needed, lightly dust the eye lids and under eye area with Lavera Fine Loose Mineral Powder. – For the eyes I choose an Everyday minerals blush in apple (a matte light rose) shade and apply it on the upper lash line and blend it well till the crease of the eye. If you use mineral makeup you can easily play and mix different products. In this case the blush works great instead of the eyeshadow, cause we want a nice subtle pink shade. – Use a black kohl pencil and line the eyes on the upper and lower inside eye line. Try Lavera black eye pencil from the newest Lavera Trend sensitive line. – Apply Lavera Intense volumising black mascara to conclude the look. – You can sculpt the cheeks and the sides of the forehead with a very soft bronzer. Alima pure bronzer Maracaibo in a light matte bronze it’s a good choice if your skin is quite light. – Lips look almost naked, so put on a mat lip tint. RMS lip shine in moment shade is a nice suggestion. – Shape the eyebrows with an eyebrow comb. The eyebrow shape here is natural and full. Hope the advices are useful and ENJOY the upcoming holiday parties! As the holidays are approaching quickly, I would like to share with you some of my favorite makeup looks from this season runways. My goal is to give you some ideas and directions about colors and techniques, so doing your holiday makeup will be a lot of fun. The most important thing here is that I’m gonna show you how to achieve these looks with green products. I named this first part Sophisticated lady, because both looks are very feminine and sophisticated. This look is all about achieving a perfect looking skin and sculpting the face with shades in delicate tonalities. I’d suggest this look to women with a pale skin tone and light colors. – Clean your face with organic skin care products. If you have a little time, exfoliate skin with a gentle sugar based peeling or try The Organic Pharmacy Flower Petal Deep Cleanser and Exfoliating Mask and proceed with a hydrating organic mask. Try The Organic Pharmacy Collagen Boost Mask, it will immediately enhance and refresh your face before applying your make-up. – I suggest a primer to even your skin tone and prepare it for the foundation. My favorite here is Vapour Stratus Soft Focus Instant Skin Perfector in 902 that is slightly pink and goes great with a light skin with pink undertones. – Add a touch of luminosity to the face with a concealer. I really like concealers in pencil that are easy and precise to use. Apply the concealer to the under-eye area, at the outer corner of the eyes, around the nose and lips for a highlighting and lifting effect. Jane Iredale Active light concealer is the perfect choice. Pay attention to get the right shade, slightly lighter than your skin tone. – Start applying the foundation or a tinted moisturizer, if your skin tone is perfect. You want to achieve a radiant and fresh skin. So gently tap your foundation into the skin with a foundation brush. Remember that the foundation should match exactly your skin tone and blend perfectly all the edges. Don’t forget the neck and decolletage if you wear an open dress. Vapour Atmosphere Soft Focus Foundation is a great choice for this look. Next, powder gently the face with a small amount of face powder to set the makeup. Satin Finishing PowderAlima Pure will give you a perfect finish without looking heavy. – Sculpt the eyelids with a light shade along the lash line towards the crease. Use the Alima Pure pearluster eyeshadow Prosecco, a soft beige with a hint of pink. Then, apply a matte taupe eyeshadow, starting from the outer to the inner corner of the eye and blend well upwards, to get a sophisticated and sculpted lid. Try Everyday minerals matte eyeshadow Wild flowers. Proceed with the same color also on the lower lash line. You don’t want hard edges, so use a tapered blending brush to smudge well. – Curl the eyelashes with an eyelash curler and apply a brown Nvey eco mascara. – Brush the eyebrows in a nice shape and fill in gently the spaces with a light brown shade. Do this with a small angled brush; you will get a precise and soft shape. When finished, brush again the eyebrows in a perfect shape. This angled Alima pure brush n.33 will work nice. – Choose a creamy blush in a light pink like Vapour Aura multi-use blush radiant in 208. Sculpt the cheeks along the cheekbones with a brush or use you fingers. Blend well! – Apply a touch of luminizer on top of the cheekbones, on the bridge of the nose and on the temples. RMS Living luminizer is an excellent choice. – Finish the look with a natural lip conditioner, just to enhance your natural lip color. The finish here is natural and just a bit glossy, to keep the soft and balanced overall look. Try the RMS lip&skin balm. The opposite of the previous look is this 50’s inspired look, where the red lipstick is its signature. It suits well the brunettes and blondes as well, especially if the eyes are blue. – The skin here is quite matte, but not too much, so we want a clean and perfectly looking skin as possible. After your skin care routine, start with a great foundation that covers any imperfections and even out skin tone. Try the Jane Iredale’s Pure Pressed Base SPF 20 that provides a sheer and semi-matte finish, but at the same time covers any imperfections. Its light diffusing properties make your skin look fresh and smooth. It’s also a great all in one product, especially, if you have no time to do the makeup. – Give a three-dimensional effect with sculpting the face with a light bronzer. Use just a slightly darker shade than your foundation, cause you don’t want to achieve a sun-kissed face. I like the Everyday minerals bronzers. Choose the shade that suits your skin tone. – Next step are the eyes. With the Pure pressed Jane Iredale eyeshadow in walnut shade contour both lash lines and smudge really well, to create a soft shadow around the eyes. Give just a touch of matte rosy color in the crease of the eye and on the brow bone and blend well. You can use the same color from the blush that you will apply on the cheeks. – Curl your lashes and apply The organic pharmacy black mascara. Don’ forget to shape and brush the eyebrows. – On the apple of the cheeks apply the Jane Iredale’s Pure Pressed Blush in Barely rose. Pay attention to apply the blush precisely and blend well the edges. If you don’t apply the blush exactly on both sides of the face, the face looks asymmetric. – The last and most important touch: With a lip brush apply the Nvey eco bright red lipstick n.369 on your lips. Contour the lips precisely and smudge well, cause the red lips must be done perfectly. You can finish with a coat of clear lip gloss (with no glitter effect) like Jane Iredale Pure Gloss for Lips in shade Just gloss. Green makeup tip: Before applying the lipstick make sure your lips are not chapped, they must be perfectly smooth. Otherwise, the red lipstick looks a disaster. Make a peeling before or brush your lips with a toothbrush to remove any dead cells. Hope I gave you some nice ideas. What is most important experiment, research and ENJOY! Soon it comes the second part with totally different looks! Just a few days ago I received my package from Vapour beauty that I was waiting so impatiently. This was my first order from them – I was searching some new makeup products with a creamy texture. Of course, I’ve previously checked the ingredients, which are not just safe, but the company is also a proud signer of Safe cosmetics. At that point, the only question for me was the result. Also the package with the products was very nice and eco friendly! First, I was a little afraid about choosing the right color, but their shade guide is excellent. I have chosen just the perfect shade for my skin tone. I have a light neutral skin tone and I was afraid that the 115 shade would be too yellow, but it wasn’t at all. The colors on the monitor vary, so take this in consideration. I was also wondering about the texture; I thought that the products will be quite oily with a heavy coverage. But I was wrong and my fears were totally unnecessary. I immediately tried the products and I was just blown away with the results. Just amazing! I can’t describe the enthusiasm, when I realized that there are companies who are already making enormous steps towards saving the environment and our health without renouncing the beauty. Since I decided to become a green make-up artist, I was used to work with products that provided great results, but with some consequences for our health. When I experienced new advanced technologies that organic makeup brands already provide, I was really surprised about their good quality. I love to use primers before I start with the make-up. They provide an excellent overall finish, optically minimize the pores and the skin looks younger and more even. Stratus instant skin perfector does this and much more! Take in consideration that conventional primers can provide a good result, but your skin is not breathing, nor is nourished, because they contain a lot of chemicals. The greatest thing with Stratus is that while you wear it, the skin is protected with anti-oxidants and moisturized because of organic evening primrose oil, papaya, pumpkin, frankincense, tulsi, and lotus flower. I especially like the fresh and even skin tone, with a natural luminosity, that Stratus help to achieve. The package is in a handy stick, so you can bring it everywhere. It comes in 2 shades: 902 is for skin with pink undertones and 903 is for skin with yellow undertones. All the products have a similar and pleasant smell, very natural, with no artificial perfumes added. The application is easy and is the first step in the process of applying makeup after cleaning the skin. I thought that I’ll have to use my foundation brush, but I apply it very easy, just with tapping lightly into my skin and then blending with my fingers to achieve a perfect finish. With Stratus you prepare your skin for the next step – foundation (if you will need it). The finish is perfect, lightly sheer and even, suitable for every skin type. Now, Stratus also comes in a liquid version, packed in a bottle. I haven’ tried it yet, but I’m sure it’s great too! I can say that the coverage and overall result after applying Stratus and the foundation exceeded all my expectations. I can easily use it for professional work on a photo shooting for example. If you will need any extra coverage after Stratus, then this foundation is the answer. It’s very easy to apply, you can gently tap it into the skin, then blend with fingers. If you want you can also use a foundation brush and apply just where you need. Their color guide is excellent and don’t be afraid, their 10 shades are developed very good, also for other ethnical skin tones. This is gonna be my next investment even for my professional use. Sometimes, when I think about foundation in stick, I think automatically of heavy coverage and oily texture, but Atmosphere is another story. Less is more and the coverage is light, even, but at the same time covers any imperfections. You feel like wearing nothing on and that’s the point, isn’t it? I think it’s worth to try also the new liquid version of this foundation. And after all, all the range of Vapour products is designed for a demanding modern woman, who search high quality and quick results. When it comes to blushes Vapour has 3 versions of Aura: classic (sheer matte finish), radiant (frost satin finish) and stain (powerful bright colors). I tried Aura in spark shade, cause on myself I like natural colors that make me look fresh and healthy. Spark is quite a universal shade in peach, that you can use on cheeks, but if you want also on lips. I’d also sculpt the eyelids with it. I think that the versatility of this products is a modern way of using the makeup. 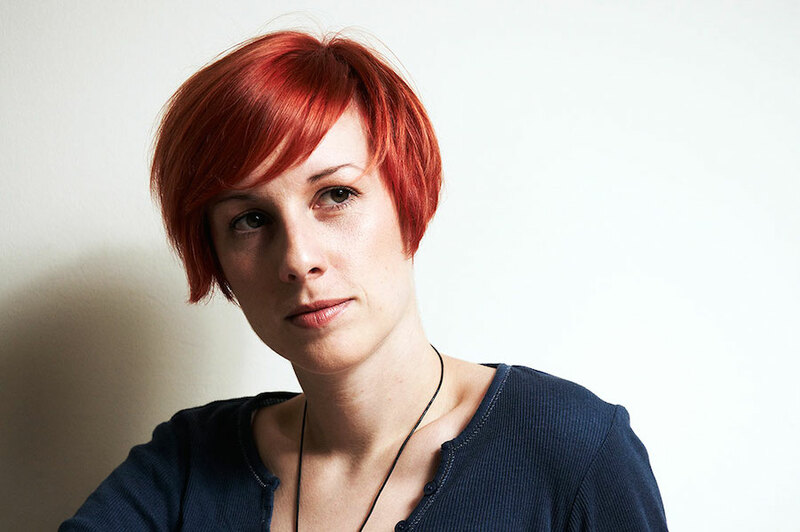 With adding more product you can go from a natural to a dramatic look. Aura is also based, like all Vapour products, on organic ingredients that nourish and protect your skin. And when you put off your makeup at the end of the day, your skin looks great and not exhausted, because of safe ingredients that protect it. 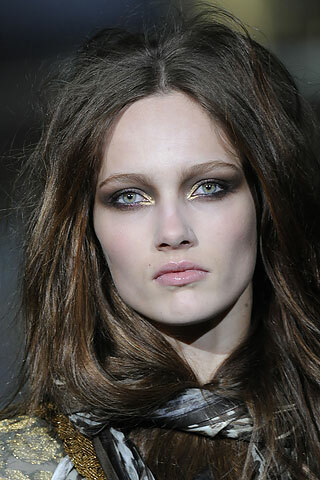 This is the look from Fendi fashion show F/W 2010 and it’s the exactly finish and look that I described in this post. Just to have an idea. I find it gorgeous and perfect for day or evening. That’s all for now, but be sure that you will hear again about Vapour products from me! 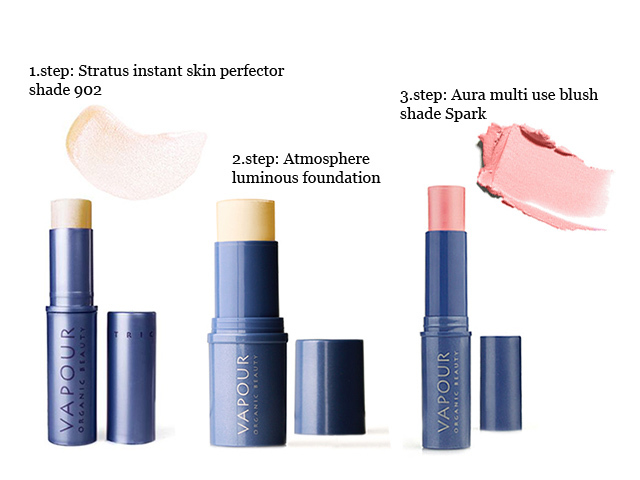 If you have any experiences to share or questions about Vapour or this look, let me know, please.